This week’s energies herald an intriguing mix of romance and rebellion; you could call it an Emotion Revolution. On Monday 31 July, love + partnership planet Venus sashays into Cancer’s sensitive, family-centred, and intensely loyal domain, staying here until 26 August. Two days later, planetary rule-breaker Uranus goes retrograde in individualistic Aries from Wednesday 2 August until 2 January 2018. Bear in mind that we’re now in eclipse season and there’s a partial lunar eclipse in Aquarius just around the corner (more on that later this week). Enjoy the positive vibes and loving feelings, but avoid the lure of making reckless/unconventional choices – no matter how exciting they seem – unless you’ve done your research and you’re well-prepared to deal with the possible fallout. So step back and rethink those plans to elope to Vegas, buddy… especially if you haven’t actually figured out how you’re going to obtain vacation leave yet, or how you’re going to pay. Btw, we’ve entered the shadow period of the upcoming Mercury retrograde. Make wise choices, and leave room for the unexpected. Make wise choices, and leave room for the unexpected. 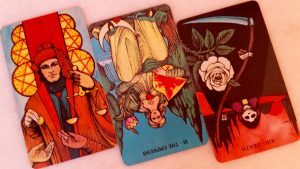 Let’s get to This Week’s Tarot Reading! LEFT: SIX OF PENTACLES. The Six of Pentacles is a card of giving and receiving. Both must be in equal balance for Karma to be fairly and appropriately administered. Additionally, this card is associated with generosity, harmony, and the positive outcomes of helping your fellow man. However, this card can sometimes indicate a gentle reminder that we need to be clear about our intentions when we give and/or take in all of our relationships. Giving in order to gain control isn’t kindness – it’s manipulation. MIDDLE: THE EMPRESS REVERSED. The Empress is THE Mother Figure of the Tarot. When she’s hanging upside-down, Mama ain’t happy, and she’ll make it painfully obvious either by becoming domineering and obsessive, or cold and uncaring. The reversed Empress: she either puts the “Mother” in “Smother“, or simply doesn’t bother. The reversed Empress lives for drama when she’s ill-dignified, and her appearance here could indicate the shadow effects of Venus in Cancer: Venus on a bad day is fixated on superficiality, and the dark side of Cancer is moody, possessive, and controlling. What this means for us: energies, people and situations could be ripe for an epic catfight. Stay out of drama, and make sure you’re not the one starting fires. As mentioned earlier: check your intentions. The Universe is watching. check your intentions. The Universe is watching. In case you didn’t know what a catfight looks like. Click at your own risk. RIGHT: DEATH REVERSED. Death is known as Transformation in some modern Tarot decks and that’s the energy coming straight for us this eclipse season. If you’ve been feeling stuck, depressed, bored and/or unmotivated for some time, this is a good week to reflect on what’s holding you back. The fear of change, of the unknown, of being mocked/misunderstood? Time for transformation. This week, release the old ways and welcome the new. Let go of limiting values and mindsets, unbalanced power dynamics, and whatever no longer serves your highest good. End dysfunctional habits in preparation for next week’s eclipse – give away your cigarettes, block your ex’s number, stop lying to yourself that you’re happy. Then redirect your time, energy and resources into new and better things. Spend time with people who actually want to spend time with you. Invest yourself in hobbies and activities that fulfil your soul and give you joy. This joy will warm your heart, give you hope, pull you out of your rut, and set you on the path to renewal, freedom and abundance. And that’s the blessing of Death, my darlings. Death’s blessing is to teach us to live – to be here now. Zodianz & Kelly Lightworker Answers: Am I A Healer?